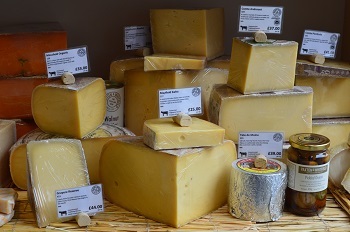 Lincolnshire Smoked Poacher - A naturally smoked handmade cheese full of flavour. Carboncino - A mild and creamy mixed-milk cheese from Piedomonte with an ash coating. Cooleeney - A handmade soft cheese from Southern Ireland with a strong flavour. Bleu d'Auvergne - A Roquefort style cheese made with cows milk with a gently salty strong flavour.